2. It’s 2:18 am. I should be asleep. I’m exhausted, but rest doesn’t come easily to me. Words, on the other hand, bombard my mind, slamming into each other so fast I can’t keep up with them: authenticity, eccentricity, hypervigilance, insignificance, contaminating, invigorating. They go on and on, ping-ponging off each other, noisily fighting for space in my limited brain, demanding that my imagination form them into something of significance. I concentrate on breathing. I silently scream a well-remembered prayer, then I add a heartfelt petition for sleep. 3. A car was out of commission on the road. The driver stood outside his vehicle, hood up, traffic creeping by, horns being honked. Some people must think that blowing a horn at a vehicle broken down on the road will make that car magically move out of the way. Others seem to think that screaming, “you’re an idiot” or “move your car”, might help resolve the problem. Maybe there’s an assumption that the person, whose car isn’t moving, is deliberately trying to ruin everyone’s day. Maybe, we need a course in humanity (or anger management)? 4. There were no magazines to read, no Muzak, just the sound of the air conditioning unit humming as I sat in a medical office waiting room to pick someone up from a procedure. New faces would appear and then disappear. The space was too small to get up and walk around. Time was moving as slow as molasses being poured through holes in a salt shaker. I people watched, checked my email, tried to write. I started to yawn, then stopped myself—it seemed “wrong” to doze off while waiting for someone who was experiencing physical pain. 5. In one of my many dreams, I was paralyzed—scared of immobility, unwilling to hear about the millions of people who live full lives while being in a wheelchair. I was inconsolable and didn’t believe that I could create a life filled with joy. Analyzing the dream, I know what it was telling me: I sometimes feel paralyzed by fears like “what if I don’t accomplish enough, can’t be enough, don’t do enough?”, “What if I fade from this world without creating a footprint that leaves a mark?” I get stuck, so often, in the muck and mire of the human condition. Those stories and journeys are unique like us. Two people I know, who read this blog via Facebook, thought that they had subscribed to “peace full home”. It turns out that they didn’t and were missing some posts. So, please hit “subscribe” so that you don’t miss any posts—they’ll be delivered right to your mail. Thank you for your comments, questions and, especially, support. 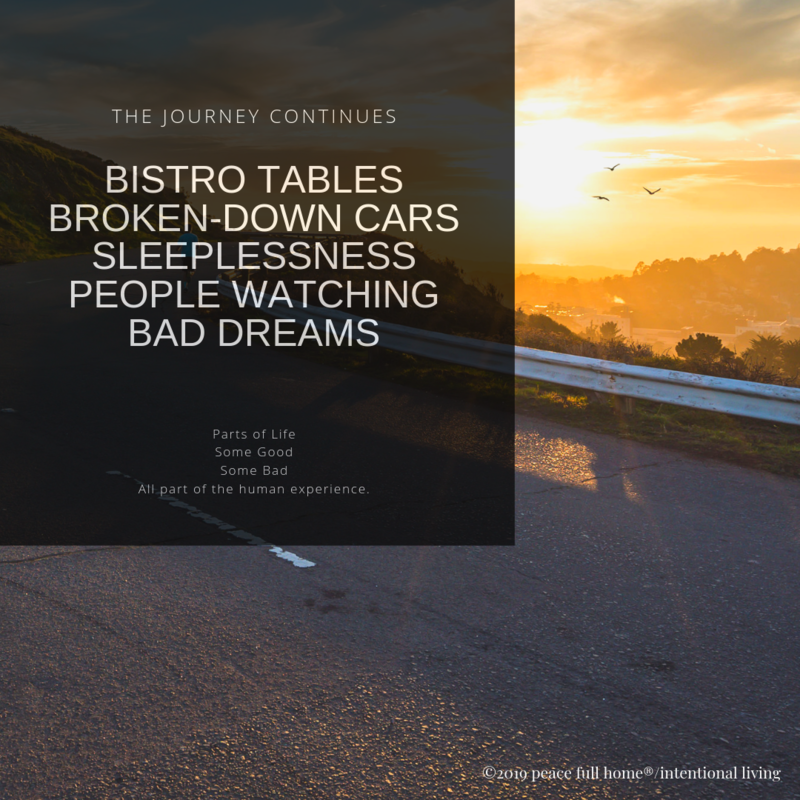 This entry was posted in Food For Thought, My Journeys, Peace & God, Peace Full Home/Intentional Living and tagged anger management, bistros, cars, dreams, exhaustion, health, tea. Bookmark the permalink. Oh My God, this is the first time I’ve read this blog and I’m blown away. Kay, you express so many of my feelings that I think I’m looking in a mirror! Thank you so much, Toni. That means a lot to me! Today, I “looked” in on you, across the miles. There you were, again, practicing your craft, being vulnerable, expecting visitors, not knowing who’d show up. Would anyone take the time to acknowledge you, or feel any of the pain in your heart? I decided to run ahead a little way and observe your journey, wishing I had an opportunity to breathe a little light under your feet. 1. That last sentence was God speaking to you, I heard it too, loud and clear. You are a blessing, Kay. Now, you are to be blessed. 2. Is a struggle for sleep a plea for rest? Are they the same thing? I’ve been told to rest in the everlasting arms of God and perhaps those wakeful moments with all of its confusion are sorted out by the spirit so I can move on with clarity. And peace comes! Is it so with you, dear one? 3. Slowing down, after passing, I see the angel leaning in under the hood, seeming to touch the place that isn’t working. Wondering if the car had a bumper sticker that said, “Honk if you see angels protecting the driver of this car.” Thankful you regard the misfortune of others with compassion. 4. You weren’t there for the magazines, music or the spaciousness of the waiting area. If I was the person for whom you were waiting, I would just be grateful you were there. The smile of relief on your face upon my release from the procedure would have been an unseen and welcome healing touch. 5. Fearful of life’s twists and turns where there is no opportunity to control it? I’ve been there. I can’t fix nor advise nor straighten any of it out, but I can tell that you are making a life of joy that isn’t always seen with the human eye. You are held tenderly in the Light of Love today and every day. What a beautiful, and thoughtful, response Dan. Thank you for looking in from across the miles. 1. And, you are a blessing. 2. I do believe that sleep and rest are tied together but not exactly the same thing. Sleep is what our bodies and minds need to function well. 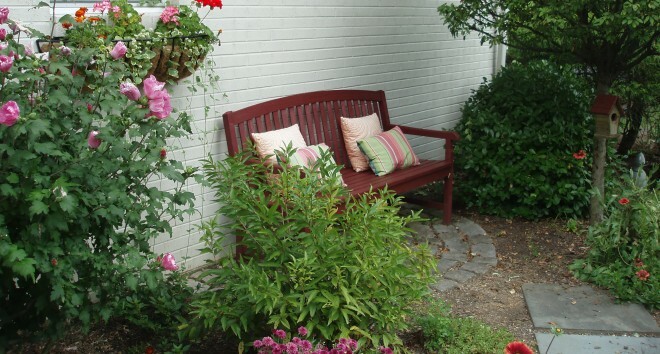 Rest feels more like renewal, like “resting in the arms of God”. 3. Seeing the angel at the broken-down car….beautiful. 4. And, I would be grateful for your presence too. You are held in the Light of Love too.